Have you ever thought about living in a city that has a beautiful view of the Front Range and is a short drive to Downtown Denver, Fort Collins, ski resorts and the Denver International Airport? I love this! Who thinks of putting on dinosaur costumes in the middle of winter and having a snowball fight? That’s thinking outside the cave! Click the link and see what the current countdown to Christmas is! Angel Hair is made from spun glass and can irritate eyes and skin. Put breakable ornaments toward the top of the tree and leave the bottom for the more durable ornaments. Make sure lighting is safe – no exposed or frayed wires – don’t be a Clark Griswald! Use a designated driver, Uber, Lift… if you’re out drinking during the holidays. Make sure you (and others) are around to enjoy the season. Defrost meats properly and use a food thermometer to make sure meat is cooked to a safe temperature. Do not leave meat out on the counter. Park in well lit parking areas and be aware of your surroundings. Do not leave gifts visible through car windows – you’re just tempting fate. Be cautious with tinsel and other garland. Make sure they are safe for pets, children, and the like. Hang stockings safely – away from open flames. Check the lights on your vehicle and make sure they are all in working order – no burnt out tail lights, blinkers, headlights, etc. You want to be able to see and be seen. Enjoy the holidays and the ones you love. Join us for a one hour workshop on Thursday, December 13, from 11 – noon at our office at 211 S. 21st Avenue in Brighton. The holidays can be a joyous time and they also can present challenges. 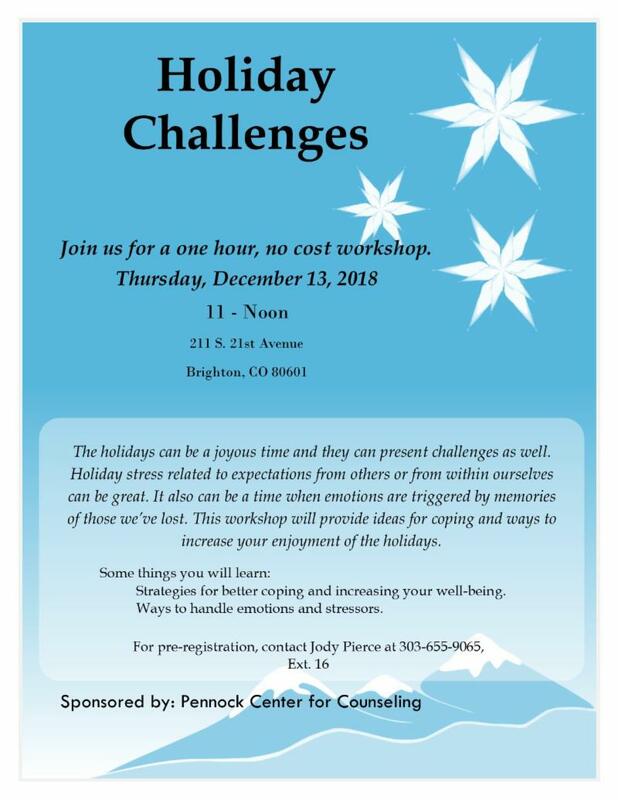 Come learn about what to do if memories trigger difficult emotions or the expectations of the holidays are just too much. Some things you’ll learn include strategies for better coping and ways to handle emotions and stressors. December 8th, the Winter Festival will kick off at 10:00am in Historic Downtown Brighton followed by the 23rd Annual Festival of Lights Parade. The parade will begin after the annual tree lighting ceremony and feature local organizations and businesses and families that come together to spread the holiday spirit. AMC Theaters, Pavilions; free (*seating is limited), sponsored by AMC Brighton 12. Historic Downtown; Multiple shops will open their doors with special sales, holiday activities and refreshments. 2 p.m. – Winter Festival – Historic City Hall, 22 S. Fourth Ave.
Activities include “Santa comes to Historic City Hall,” sponsored by First National Bank; face painting, sponsored by IBEW Local 111; hay rides, sponsored by Platte Valley Medical Center; petting zoo, sponsored by Power Home Remodeling; and the Teddy Bear and Friends Tree. 4:15 p.m. – 10th Annual Paw & Pal 1.5k Run/Walk – Longspeak Street and North Fourth Avenue. Let your dog get in on holiday fun. Prizes will be awarded to the first- and second place winners in each weight category. There is a $15 entry fee. Proceeds will benefit Platte River Track Club. The Festival of Lights Parade follows the tree lighting, traveling down North Main Street, then east on Bridge Street. The parade will include more than 75 fully-illuminated entries and floats that highlight the theme, “A Hometown Holiday Tradition.” To become an entry in the parade, visit http://www.brightonco.gov to download the required forms and view deadlines. All activities are free and open to the public. The event will take place snow or shine. 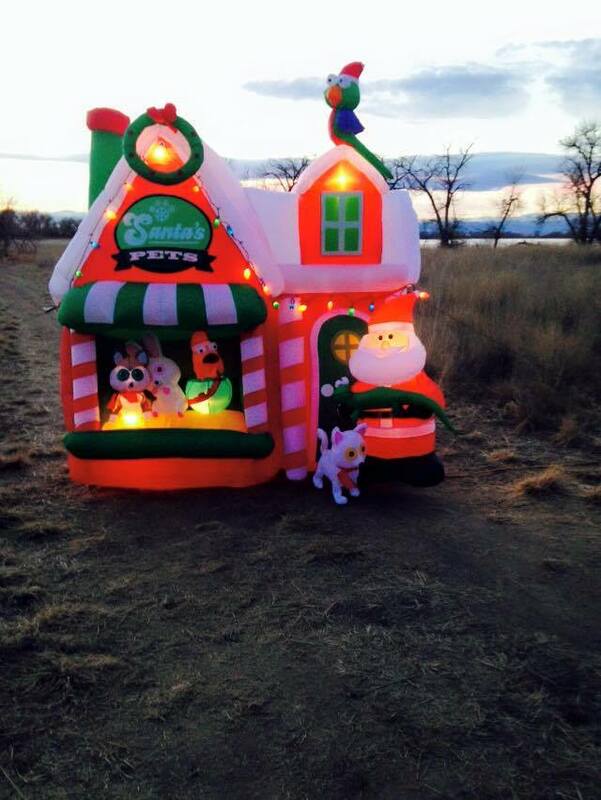 For more information, call 303-655-2218 or visit http://www.brightonco.gov/festivaloflights. 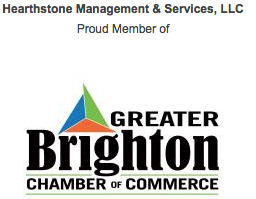 The city acknowledged the important role of its event sponsors who help make this event possible: TREE LIGHTING SPONSOR, United Power; PLATINUM SPONSORS, AMC Brighton 12, Brighton Urban Renewal Authority, Downtown Partnership Committee, IBEW Local 111, Platte Valley Medical Center, and Brighton Fire Rescue District. Join the Richard Lambert Foundation this holiday season at our annual Lights of Life Memorial Lighting Ceremony – a gathering to honor and remember our loved ones. Lights on the tree represent memories of loved ones who are remembered at this time of year. The lighting ceremony will be held on Thursday, December 6th at 6:30pm which will include reading of names, musical performance and light refreshments. Attendees are encouraged to bring a 3×5 picture of loved one to hang on the Memorial Tree. Pictures will be kept by the Richard Lambert Foundation to display on the tree each year, to always remember your loved one. Join Barr Lake for a short hike to celebrate the wonders of winter on the lighted bridge and Niedrach Trail. Fun activities will be indoors as well as outside, including our lighted trail, kids’ crafts, face painter and a VISIT FROM SANTA CLAUS! There will also be hot cocoa, cider, cookies and more! This event is free with your daily parks pass or annual Colorado Parks and Wildlife pass. What is a Real Property Transfer Declaration? Hearthstone Management & Services, LLC is Independently Owned and Operated and fully supports the principles of the Fair Housing Act and the Equal Opportunity Act. Listing information is deemed reliable, but is not guaranteed.